Molluscum contagiosum is a viral infection caused by a virus from the poxvirus family. The lesions appear as round, dome-shaped, pink, waxy papules (solid bumps) on the skin. They appear anywhere on the body, but most commonly are seen on the face, neck, armpits, arms, and hands. It is a communicable condition and is transmitted by using towels, clothes, or other objects used by an infected person. It can be also be spread by sexual contact. People having weakened immune systems such as with cancer or AIDS have an increased chance of contracting molluscum contagiosum. Warts are a skin condition caused by human papilloma virus (HPV). They appear as soft, fleshy, raised lesions on the skin surface. They can occur on any parts of the body. They are contagious and can be transferred from one person to another through towel, soap or through skin contact. Warts are resistant to treatment because they penetrate very deep inside the skin surface. Molluscum contagiosum and warts are usually painless and do not itch. However, if picked at or scratched, they can spread covering a larger area of skin. The lesions tend to spread in a line or in groups called crops. Salicylic acid: Inexpensive, over the counter, wart treatment; requires daily application and takes time to work. 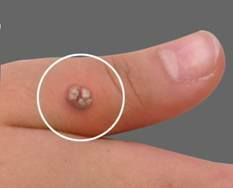 Liquid nitrogen: Cryotherapy treatment kills warts and mollusca by freezing them. It is applied to the wart by your physician and usually requires more than one treatment. If these treatments are unsuccessful your dermatologist may recommend treatment with Cantharidin..
Cantharidin, also called Cantherone, is a blistering solution obtained from blister beetles to treat viral conditions such as warts and molluscum contagiosum. It is well received by children as it painless during treatment. However pain and tenderness may occur after 24 hours of treatment that may last for a few days. Cantharidin is applied directly on the warts and mollusca affected areas and covered with a Band-Aid or piece of clear tape. In 4 hours, you should peel off the covering and wash the area carefully with soap and water to completely remove the Cantherone. If there is severe stinging or burning before the time is up, you can remove the tape or Band-Aid and wash the area sooner. Blisters will start to form in about 3 to 8 hours. Warts are destroyed upon this chemical application. Some patients may be very sensitive to cantharidin and may experience tingling or burning sensation at the site of application. Hence this solution should be carefully applied only to the warts and mollusca avoiding surrounding skin. For more details on cantharidin treatment on warts and molluscum contagiosum please contact your doctor.